The imposing mass of Liathach dominates Glen Torridon and Upper loch Torridon with its steep terraced sandstone slopes. Of the six peaks along the 7km summit ridge, two have been ranked as Munros, but the whole ridge should be included in an ascent. Spidean a' Choire Leith is a craggy peak on the pinnacled ridge. 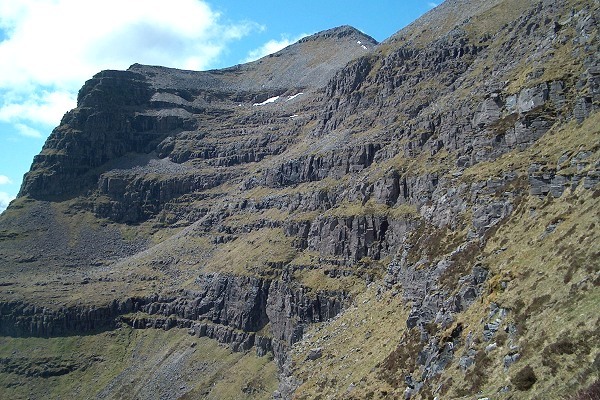 Scrambling and a head for exposure are required for Liathach and there is no alternative safe route off the ridge, other than the ascent routes at either end of this steep sided rocky Mountain. Some of the scrambling can be bypassed but the alternative path may be very exposed. 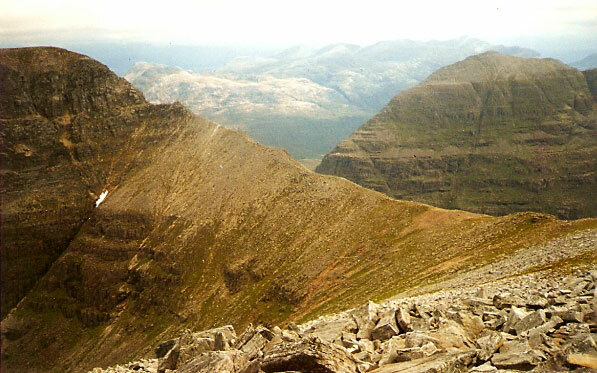 Liathach from Sail Mhor July 1992. Looking across Toll a' Meitheach to the summit of Spidean a' Choire Leith, from the steep and scrambly ascent track. a good scramble over the pinnacles 14/4/07. a fantastic ridge. The summary information of one or more ascent routes that include Spidean a' Choire Leith. 1 1500 m 10.98 km 5 hrs Spidean a' Choire Leith and Mullach an Rathain A classicroute. 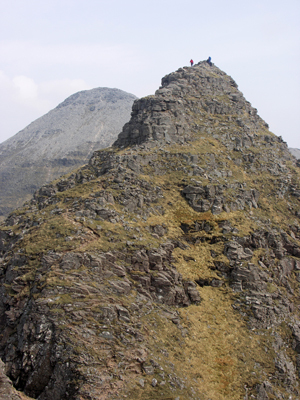 Liathach is an imposing massif, the ascent is steep and the traverse requires scrambling. If you have the head to traverse the pinnacles, then it is truly wonderful route. These are the days that we climb for. 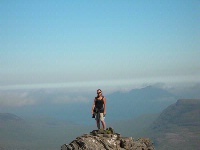 Gordon at the summit. Post a few words about Spidean a' Choire Leith or read what others have had to say. If traversing east to west, save some energy for the descent down from Mullach an Rathain. It's hard on the legs! The pinnacles are perfectly do-able if time is taken and thought is used. I wouldn't fancy the alternative path much. A realy great hill which rewards you for slogging up to it's ridge. A fantastic mountain in a wonderful area. 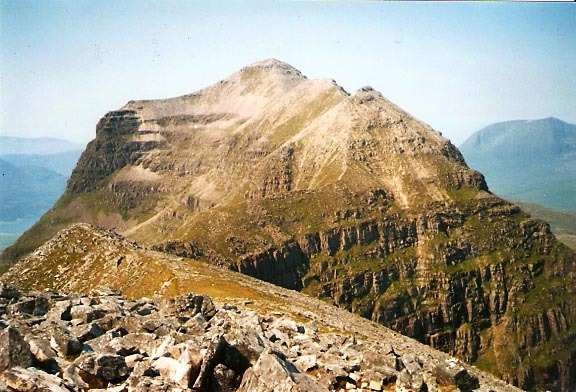 Liathach is an imposing mass of sandstone that looks impregnable. 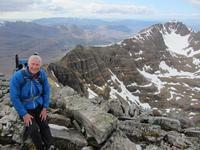 Trust the Munro Magic route and you will be rewarded with one of the best ridge walks I have undertaken. The "walk in" from the East is on a well defined path right to Col at 840m. Thereafter some scrambling and a head for exposure are required for the Fasarinen Pinnacles. Some of the scrambling can be bypassed but the alternative paths, to the south, looked to be just as exposed. A superb route.